As cross-selling practices continue to make headlines in the national press, it is important to keep in mind that cross-sales of banking products are not inherently problematic. Of principal concern are incentive-based compensation practices, long on the radar of both regulators and legislators alike, that have the appearance of fostering abusive cross-selling practices. Criticism is centered on incentive compensation programs that encourage improper behavior in the sales of customer products. Bankers who had previously touted their focus on cross selling have recently voiced concerns that while they have complete confidence in their own practices, examiners could hold a different view. The question for them is not whether abusive practices have occurred, but if incentive compensation programs or other perks could be perceived as encouraging improper behavior in the future. The ability to offer complementary products and services that meet customers’ needs is clearly important to customer retention and relationship-building. Thus ensuring that incentives align with the needs of the customer is imperative. This requires input of management in the development and implementation of compensation programs and oversight of the operation and structure of such arrangements by the board of directors. From an employee’s perspective, an incentive plan that is straightforward and easy to understand is the best practice. 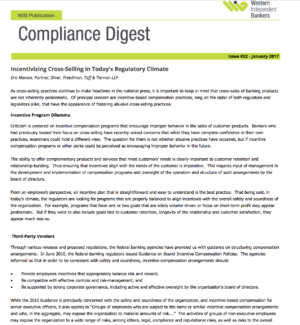 That being said, in today’s climate, the regulators are looking for programs that are properly balanced to align incentives with the overall safety and soundness of the organization. For example, programs that have one or two goals that are solely volume-driven or focus on short-term profit may appear problematic. But if they were to also include goals tied to customer retention, longevity of the relationship and customer satisfaction, they appear much less so. Be supported by strong corporate governance, including active and effective oversight by the organization’s board of directors. While the 2010 Guidance is principally concerned with the safety and soundness of the organization, and incentive-based compensation for senior executive officers, it also applies to “Groups of employees who are subject to the same or similar incentive compensation arrangements and who, in the aggregate, may expose the organization to material amounts of risk….” The activities of groups of non-executive employees may expose the organization to a wide range of risks, among others, legal, compliance and reputational risks, as well as risks to the overall viability of the organization. Designing and implementing compensation arrangements that properly offer incentives for non-executive employees to pursue the organization’s long-term well-being and do not encourage imprudent risk-taking is a complex task that requires the commitment of adequate resources. Compensation arrangements should strive to find the proper balance between short-term benefits and long-term risks and rewards.